SAO 98967: Regulus, type B7V, magnitude 1.36, in Leo. This image is a single eight second drifted (unguided) image of Regulus’ spectrum using the Rainbow Optics transmission grating threaded into the nosepiece of the MX-5c imager. MaxImDL was used to take the image and process the data. 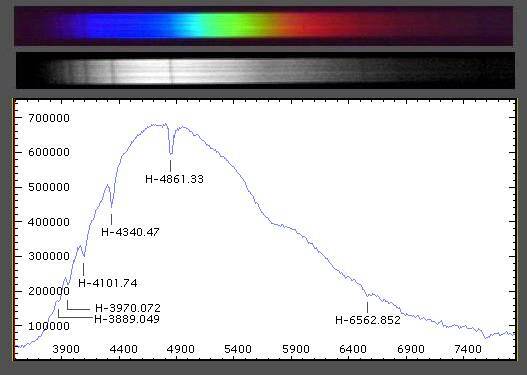 This is my first attempt at home-spectroscopy. I thought the choice of subject was appropriate to the name of our website! I have not yet gotten into the positive identification of the various lines, but the Balmer Hydrogen series is visible throughout. Calibration was done using VSpec software. The values are CCD image intensity vs. Angstroms. April 5, 2001. This image is a single eight second drifted (unguided) image of Regulus’ spectrum using the Rainbow Optics transmission grating threaded into the CFW-8 filter wheel of the ST-7. MaxImDL was used to take the image and process the data. Callibration was done using VSpec software. The values are CCD image intensity vs. Angstroms. April 10, 2001. 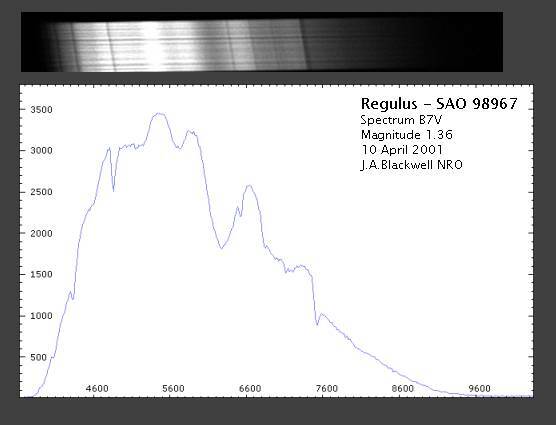 The top image is a single 4 second drifted (unguided) image of Regulus’ spectrum using the Rainbow Optics transmission grating threaded into the nosepiece of the ST-7 imager. MaxImDL was used to take the image and process the data. Calibration was done using VSpec software. The values are CCD image intensity vs. Angstroms. May 5, 2001.The second image was taken on 17-March-2005 using a grism on an ST-8XME NABG imager through a Tak FSQ-106n at f/5. The image has been frequency calibrated and corrected for instrumental response using VSpec software.